Cut paneer into small cubes. Fry over medium heat until light brown. Keep the paneer pieces aside. Saute the dry fruits in one tablespoon of oil. Grind onion, ginger, garlic, green chilli in a blender and make a fine paste. Fry the mixture in the remaining oil until golden brown and oil starts separating. Add salt, red chilli powder, white pepper, turmeric powder, garam masala. Saute for 1-2 minutes. Add milk to make the gravy. Bring the gravy to boil. Reduce the heat and cook until the gravy becomes thick. Put a portion of the dry fruits in the gravy while it is being cooked. Keep the rest of dry fruits for decorating. 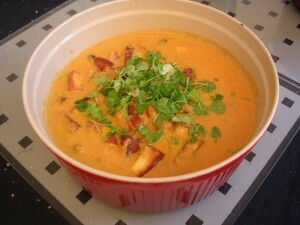 Finally add paneer cubes and 1 tbsp cream. Heat for 5 minutes. Garnish shahi paneer with cream and dry fruits and coriander leaves.